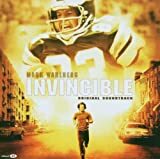 Accueil Produits Bande originale La bande originale de “Invincible”. La bande originale de “Invincible”. Cette bande originale ne contient que des chansons et aucunes musiques du film. 1. I Got A Name (par by Jim Croce) – 3:11. 2. Let It Ride (par Bachman Turner Overdrive) – 4:23. 3. I Just Want To Celebrate (par Rare Earth) – 3:35. 4. Free Ride (par Edgar Winter) – 3:05. 5. Mandolin Wind (par Rod Stewart) – 5:32. 6. Drift Away (par Dobie Gray) – 3:55. 7. Funk No. 49 (par The James Gang) – 3:53. 8. Do You Know What I Mean (par Lee Michaels) – 3:14. 9. Let’s Work Together (par Canned Heat) – 2:46. 10. Fooled Around And Fell In Love (par Elvin Bishop) – 4:35. 11. How Long (par ACE) – 3:23. 12. Feelin Alright (par Grand Funk Railroad) – 4:25. 13. Stranglehold (par Ted Nugent) – 8:23.